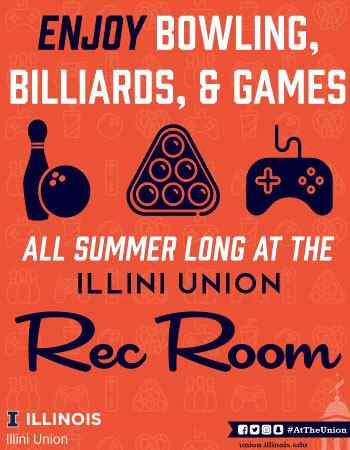 Thank you to the Illini Union Rec Room for sponsoring the 2018 Champaign-Urbana Area Fourth of July Fireworks Guide. Here is a pocket guide to the upcoming schedule of Champaign-Urbana area fireworks displays on or around the Fourth of July. Fireworks for days and days! Did we miss one? Let us know in the comments below, tweet at us (@chambanamoms), Facebook us, or send it to editor (at) chambanamoms.com. 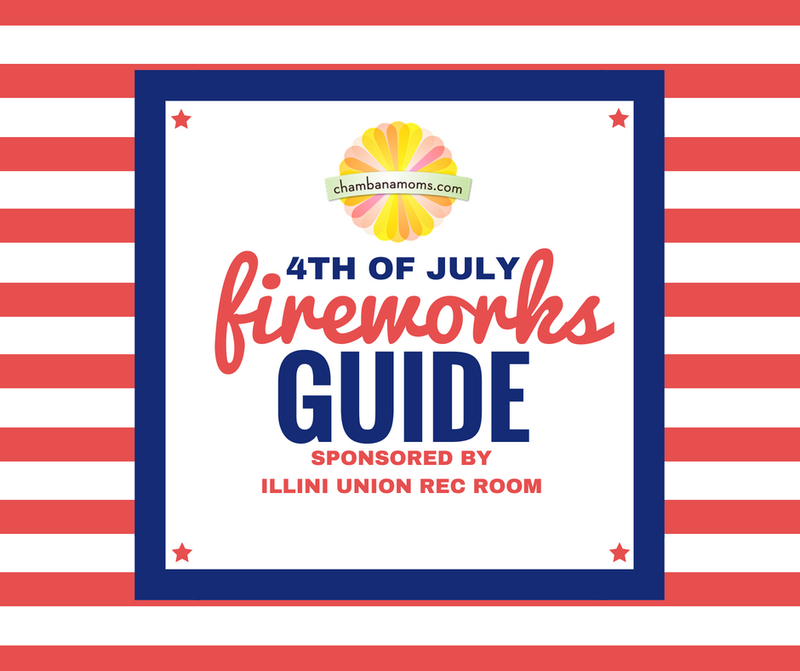 If you are looking for a more extended guide to Fourth of July events, check out our Fourth of July activity guide. Farmer City Raceway: Fan Appreciation Night. Includes full show and fireworks. General admission is $5. Arthur’s Freedom Celebration and Fireworks: One of the biggest fireworks displays in central Illinois. Beginning at approximately 9:30pm, a continuous, 27 minute barrage of thousands of aerial displays including some of the biggest shells available in the country fill the night sky, all timed to music simulcast on 106.7 FM/The Fox.Other crowd favorites include the 500 foot long “Wall of Fire”and the 500 foot long “Niagra Falls” display. And when the “Rural Patriot” makes his ride across 500 feet or more of flowing ground displays, people cheer. Tolono Fun Day: West Side Park. Parade at 11 a.m., fireworks at 9:15 p.m. Bigger than last year! Free. Gifford Community Celebration: There will be fireworks at dusk in Werner Roessler Park. Free. Saybrook Stars and Stripes Celebration: Fireworks at dusk conclude this day of fun, which include bounce houses, a dunk tank, touch-a-truck and more. Arcola Fourth of July Fireworks Display: Fireworks at dusk at Moore Park in Arcola. Located just off Route 133. Villa Grove Freedom Festival: Fireworks at dusk at Richman Park. Monticello Freedom Fest: Annual fireworks, food and fun festival at Lodge Park. Wrap up the evening with this annual spectacular fireworks show! Free admission. Make the night extra simple and take the train or the shuttle to the fireworks! Rantoul Freedom Celebration: Fun activities for kids 5:30-9pm and end with fireworks at dusk. Champaign County Freedom Celebration: The evening’s festivities begin at 7 p.m. with musical entertainment on the main stage which will be located along Kirby Ave between First & Oak Streets. There will also be children’s activites. (bounce house/inflatables) Parking is available in the State Farm Center and Activities and Recreation Center (ARC) parking lots. Following the music, at around 9:10 p.m., there will be some announcements & presentations. After the announcements, there will be the singing of our National Anthem, an invocation, and then the retiring of our nations flag by a color guard. Immediately following, the always entertaining fireworks display. Freedom Fest, Lake of the Woods Park, Mahomet: Kids’ activities, food, live entertainment, fireworks at dusk. Admission is $2 per person, with children 5 and under free. Military persons with ID get in free. Homer July 4th Celebration: Near Village Hall. Parade at 6 p.m. and fireworks (bigger and better than ever!) at dusk. Free. Paxton’s July 4th Celebration: Enjoy daytime activities at Pells Park like a bounce house, face-painting, and watermelon eating contest. Head to Bixby Park in the evening for fireworks, food and more fun! Sibley Area 4th of July: Enjoy activities all day long and wrap up the celebration with fireworks over Lake Sibley. Oakwood Fourth of July Celebration: Parade at 11 and activities at the park begin at 4. Fireworks at dusk. Take the provided shuttle to and from the park! Danville Dans Fourth of July Game and Fireworks: $4 per person admission to the baseball game, which will be followed by fireworks. There’s also a $4 hot dog/soda combo! Celebrate Clinton Association Fourth of July Fireworks, 9:15. Free. Tuscola Sparks in the Park: A full day of activities including a 5K, parade at 10 a.m., children’s activities at 11 a.m., live music and fireworks at dusk at Ervin Park. Hoopeston: The City of Hoopeston will have their fireworks display on Saturday, July 21st at dusk. Did we miss your favorite fireworks displays? Let us know in the comments.